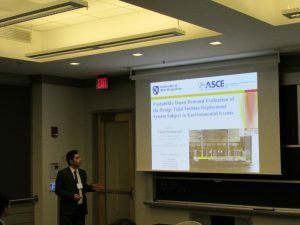 In May 2018, Dr. Vahid Shahsavari participated in the Engineering Mechanics Institute Conference (EMI2018) in Cambridge, MA. He gave a talk about probability-based assessment of a tidal turbine deployment system* exposed to harsh environmental events. The results of this study have been used to develop an operational decision-making guide for turbine operation in response to environmental demands. *The south pier of the Memorial Bridge is instrumented by a tidal turbine deployment system.